This was just as ridiculous as the TV show, which is a compliment. That's why I watched the show. 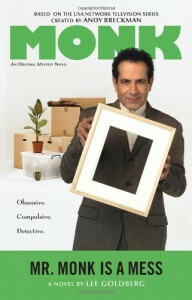 If you don't like the far-fetched comedic mystery with no regard for actual police procedure, don't read or watch Monk. I think the best part of this book (and I have not read any others in the series) was the transition of Natalee Teeger from Monk's assistant to cop (and character in her own right). I wouldn't mind reading a cozy series based around her.